13 year old Paige Raw lives in the Ezulwini Valley in Swaziland. “I have a river in my front yard and a mountain in my backyard – but if you think I live in the bush, think again… there’s actually a Woolies Food just one kilometre from my door,” she says. Paige enjoys school and she plays all sports, with her passion being for swimming and hockey. “Ever since I saw Chad le Clos winning in the 2012 Olympics, he’s been my inspiration to train hard, but if I saw him in real life, I think I would just faint straight away,” she says. Paige swims for the Swazi National team. 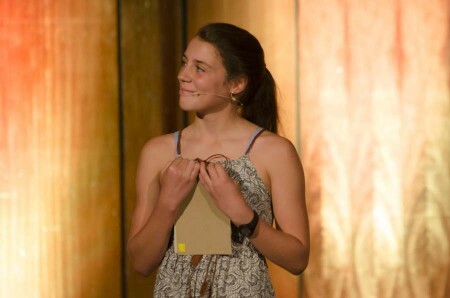 At FEAT Kids (Jo’burg, 8 October 2015) Paige spoke about her adventurous travels in China (Paige was 11 at the time of the trip).